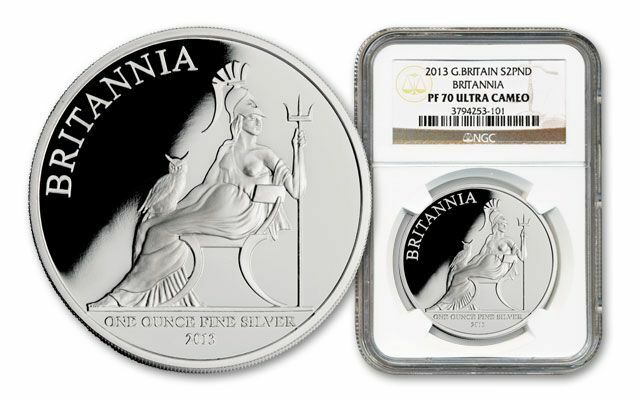 This set of Britannia proofs represent the first in what is considered a new series in coin history. Why? 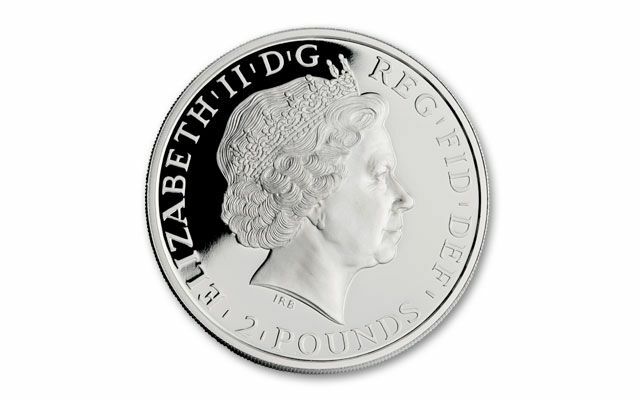 Quite simply it’s because the Royal Mint made the decision to increase the precious metal content in the Britannia coins. 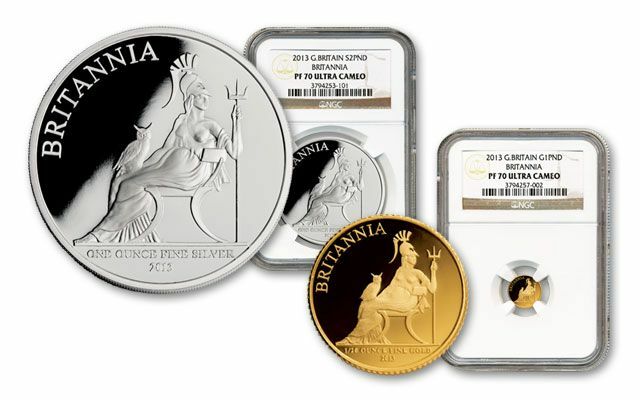 In 2013 the first ever 99.9% silver and 99.99% gold coins were released making them the purest Britannias ever struck by the Royal Mint. Also, there’s another reason that the 2013 marks an important key date for Britannias. 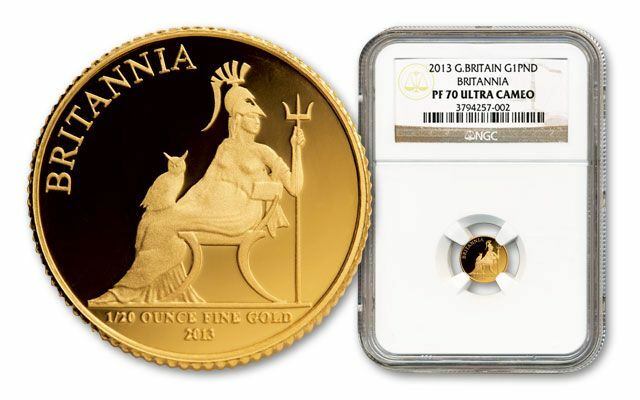 It’s the first time in history that the Britannia was released in a one-twentieth-ounce gold size and it’s the first time that a gold Britannia held the £1 (One Pound) denomination. Add all of these together, plus the desirability of a one-year-only design on the reverse and it becomes clear that these proofs are highly collectible and in high demand. 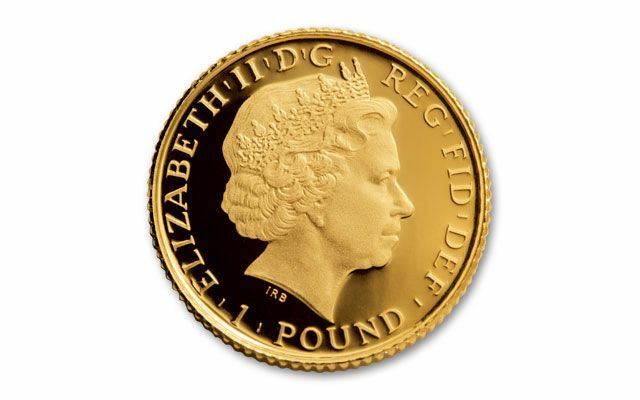 This set includes two legal-tender 2013 Britannia proofs, including: a £1 (One Pound) proof struck in one-twentieth ounce of gold and a £2 (Two Pound) proof struck in one ounce of silver. Each comes graded in perfect Proof-70 (PF70) condition by Numismatic Guaranty Corporation (NGC) and comes in a wood presentation case with a mint-numbered certificate of authenticity. This exclusive opportunity is limited to no more than 500 sets, and they’re only available here at GovMint.com. Don’t wait. Add this key date set to your collection today!